A comprehensive outline of George Best Belfast City Airport’s multi-award winning approach to corporate social responsibility. At George Best Belfast City Airport, corporate responsibility lies at the very heart of operations, with a strategy that endeavours to support, engage and give back to the local community. With an extensive portfolio of creative corporate responsibility (CR) activities, the airport strives to ensure a positive impact within its neighbouring community. Its reputation for upholding the highest standards in CR policy is driven by three core strands: people, community and environment. As one of the largest employers in East Belfast, its 1,500 employees on site are the lifeblood of the airport which aims to invest in the professional development of each employee and exceed the expectations of a responsible employer. The airport’s enthusiasm and commitment towards corporate responsibility is reflected at all levels of the business with employees devoting more than 2,000 salaried hours to a number of volunteer initiatives. The extremely successful ‘Time to Read’ programme sees employees visiting the airport’s adopted and neighbouring schools to provide support with reading and in turn, encouraging the development of the pupils’ communication skills. 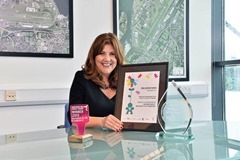 Spearheading the airport’s CR activity is Michelle Hatfield who, after receiving numerous awards, including being named the Leader of the Year in Corporate Responsibility at the prestigious IoD Director of the Year Awards in London, is regarded as a UK and Ireland leader in this field. It is under Michelle’s watch that the airport’s High Flyers Apprenticeship programme was born. Recognising the wider economy and the barriers it presents to young people seeking employment, the airport established a scheme whereby under-24s can achieve a balance of workplace experience and vocational qualifications with the aim of increasing their employability. With support from commercial and operational partners, the airport offers young people from the Greater Belfast area work placements lasting up to two years in areas such as retail, catering and hospitality, human resources, customer service and administration. Being mentored by members of the senior team, the participants develop a rounded skillset and attributes that stand out on a CV to potential employers. 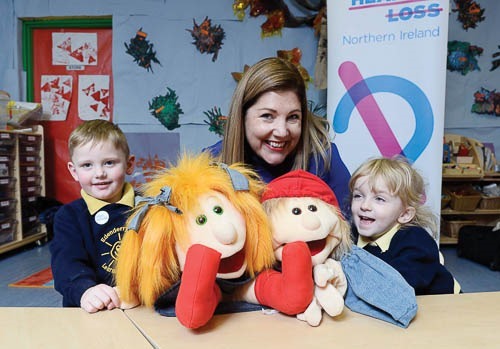 At the heart of its community, Belfast City Airport has now invested more than £170,000 into a number of local groups and projects through its Community Fund. With a focus on community relations, sport, social development, environmental responsibility and education, projects supported by the Community Fund have included the Belfast Children’s Festival, Bangor International Choral Festival, Meningitis Research Foundation Awareness Week, the National Autistic Society, NI Stroke Association, Action for Hearing Loss, Cinemagic’s Under 12s Film Festival, Transplant Sport NI and many more. The Community Fund welcomes projects and organisations from the Greater Belfast area that provide experiences or opportunities for young people that without financial support from the airport would not have been possible. 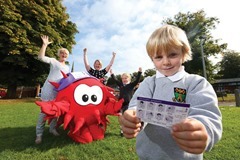 Supporting initiatives that can influence, educate and encourage young people from all backgrounds dovetails perfectly with the airport’s commitment to enrich and support the local community by working with other key stakeholders to build capacity, skills and optimism for a positive, shared future. With a dedicated Environmental Manager on site, protecting both the surrounding and wider environment is a top priority within the airport’s CR policy as it continues to implement initiatives to reduce its carbon footprint and promote greener alternatives for operational practice. All employees have recently participated in a general environmental awareness programme and are encouraged to share ideas on how to address issues such as energy consumption and waste reduction. Belfast City Airport has consistently scored highly in the Business in the Community ARENA Network Environmental Benchmarking Survey which is recognised as the principal measurement of environmental engagement in Northern Ireland. In 2014, the airport achieved the very commendable Gold status with a score of over 80 per cent. However, the airport’s efforts do not stop at Gold with plans already in place to improve standards further. 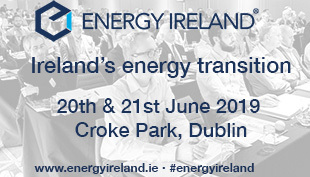 This includes the roll-out of low energy LED lighting in the terminal building and the introduction of a food waste recycling trial for some of its business partners. As keen enthusiasts for corporate transparency, Belfast City Airport operates an open door policy that welcomes feedback from the local community and opportunities to discuss any element of the business with the management team. Recognising its place as a key economic driver and facility within the area, the airport ensures the local community is kept up to date with activity through regular communications. This includes a monthly e-zine distributed to approximately 130,000 stakeholders, a Community Newsletter received by almost 60,000 neighbouring households throughout the year, and social media channels which operate throughout the week to address any queries from passengers and members of the public. Listening and ensuring corporate responsibility is at the centre of all of the airport’s operations and has allowed the airport to build lasting relationships with the community. The airport’s continued investment as a facilitator and as a significant employer ensures that East Belfast has an airport of which its community can be proud.